Sigh, such a frustrating episode. While some may deem this and episode 3 as less interesting, I can’t say I agree. Plus, when you’re doing a drama with 30 episodes, there will be some that aren’t as well-paced. These two episodes are really I think to help get the plot going faster and to build the relationships of the parents and children even more. So, was it a spectacular episode? No. But it was still a good episode. And you know what? 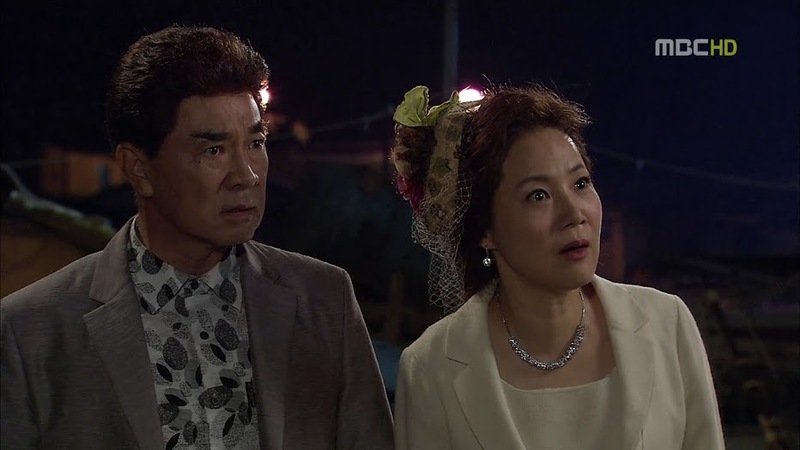 Jang Do Hyun and Chun Dal Soon almost appeared human in this episode. Note, I say almost. However, they fail epically as humans and parents. We start with the kids desperately bailing water out to no avail. The water just keeps rising and rising. 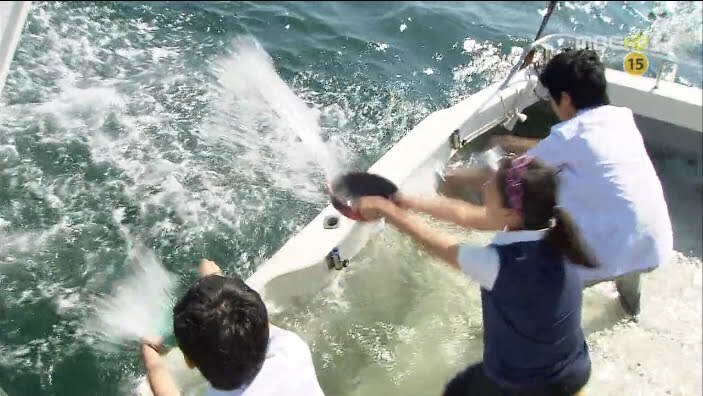 Meanwhile, Hong Chul gets back with the engine part for Jang’s boat (I feel so stupid that I didn’t realize it was Jang’s boat’s engine Hong Chul was looking at) and he finds it gone. Where did the boat go? A coworker replies that the other repairman must have tried fixing it with Korean parts and went out to test the repair work. Hong Chul is then told he can leave. He looks around for Hae Joo and asks where she went. His coworker tells him that he hasn’t seen her for awhile, so she probably left ahead of her dad. So many problems here. I can’t believe that the dock was completely deserted that none of the workers noticed kids getting into a broken boat and driving away. But…these random things do happen in real life. Back on the boat, Queen In Hwa is still standing on the ladder out of the reach of rising water. She keeps complaining and telling the other three to bail out water faster. Kang San gets really annoyed and snaps at her to come down and help then. In Hwa is shocked. Why should she? This girl is beyond stupid. Hae Joo looks to Chang Hee and tells him this isn’t going to work as the water is rising too fast for them to keep up with. She then asks if any of them know how to use the radio, but none of them do. So Hae Joo rushes into the cabin to call for help, but the radio is dead. Of course, Hae Joo doing this annoys In Hwa as Hae Joo shouldn’t be wasting time and should still be bailing water. Hong Chul gets home and Dal Soon comes out. She gets angry as soon as Hong Chul asks if Hae Joo is home yet. She starts complaining about how all Hong Chul thinks about is Hae Joo. He tells her to just tell him if his daughter is home yet or not. Dal Soon yells that the witch isn’t. This really worries Hong Chul. Just where could his daughter be? At this same time, Geum Hee is ready to leave for the opera. Il Mun comes downstairs and announces that In Hwa is still not home. How can this be? Geum Hee sent Chang Hee to go pick her up hours ago. 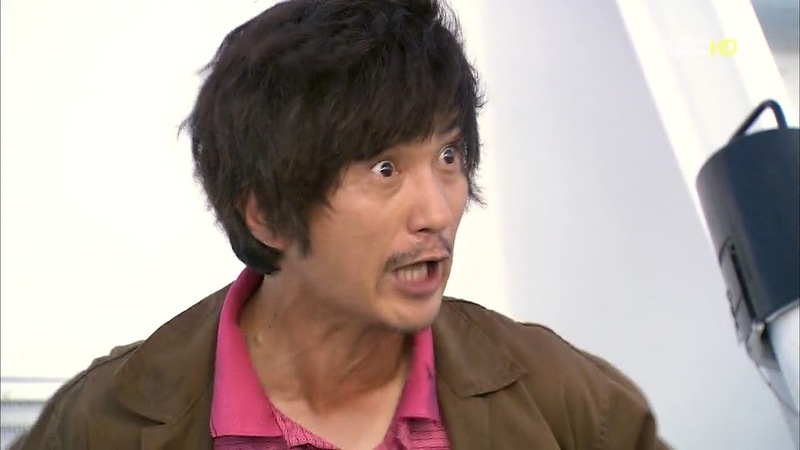 This really freaks Geum Hee out and Jang looks…angry. I guess anger is his way of expressing concern for his daughter. The four get out of the boat before it sinks and cling on to the orange rescue cube. In Hwa starts crying and panicking again because she’s going to die. She doesn’t even know how to swim! The other three assure her that they won’t die yet and since she has a life vest on, she won’t drown if she can’t swim. Meanwhile, Hong Chul gets back to the docks where his boss comes looking for In Hwa after a call from Jang. It’s then noticed that the Jang boat is missing. The other repairman said he didn’t touch it at all. The kids couldn’t have possibly taken it out, right? The Jangs and Park show up at this time. It is then confirmed that a girl and boy were seen entering the boat. 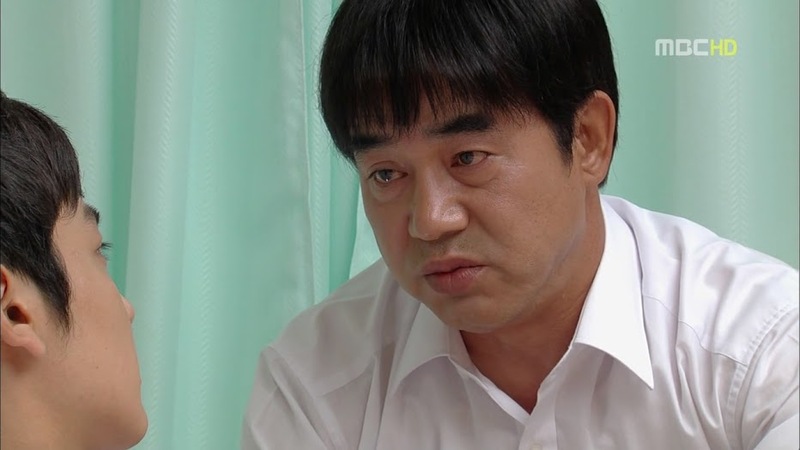 The boy is identified as Kang San so Kang is called about his missing grandson. Jang immediately demands the coast guard be called in to find the children. 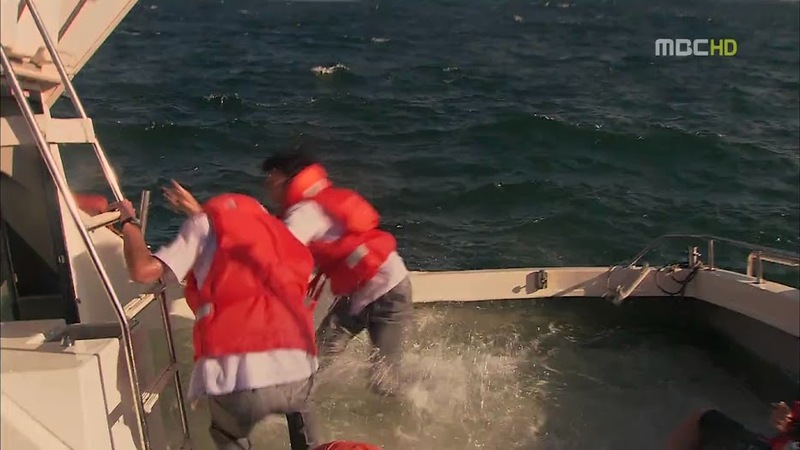 The boss says there is no guarantee that the kids took the boat, but Jang gets all up in his face and slaps him, too. We then get a very stupid scene. 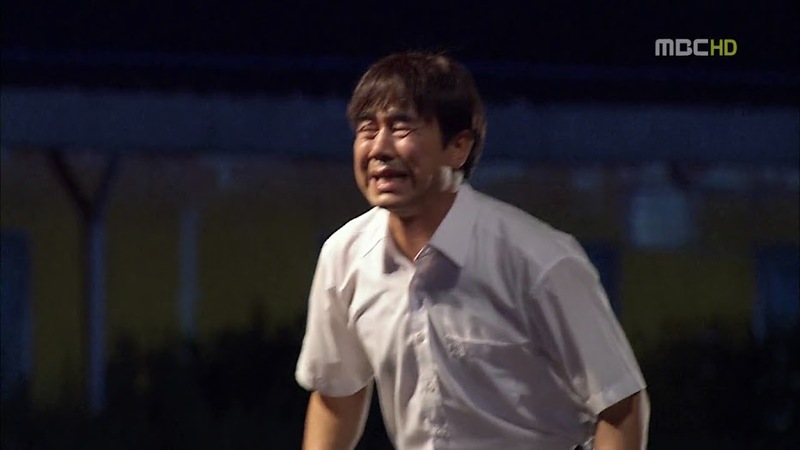 Hong Chul, Gi Chul, and Geum Hee run to the end of the docks screaming their kids’ names over and over again. Um…how is that helping? In Hwa is being her usual self and crying and complaining about being cold and not eating pizza and dying like this. Hae Joo tells her to stop wasting energy and Kang San tries to assure her that it’s warm and not cold since it’s summer. Well…you’re in an ocean, that never gets warm really in the summer depending how far out you go from shore and how deep it is. Chang Hee, surprised by Hae Joo’s calmness asks if she isn’t scared. Hae Joo replies that she is frightened, but that will get her nowhere. LOL. Such a stark different between the two girls. I think this makes Chang Hee like her even more. When Hae Joo expresses worry over how far they’ve gotten from shore, Kang San tells her not to worry as his grandfather will make certain that they are found no matter what. The coast guard has arrived and art plotting out quadrants to search when Kang arrives. He immediately wants to speak to the head who happens to be in Seoul. He then requests helicopters, but that’s impossible since its so dark. This does not make Kang happy at all. He even orders that all his ships be sent out to search. His worker asserts that is a bad idea as those ships are much too big to be of any use. Kang doesn’t care, he just wants his kid found. Jang confronts Kang about Kang San driving the boat. Kang asserts that his grandson hasn’t been taught how to drive a boat so it couldn’t possibly be him. Also, Kang wants to know just why his grandson would be with Jang’s daughter. Jang has no idea either. At the mention of driving the boat, Hong Chul gets uncomfortable. 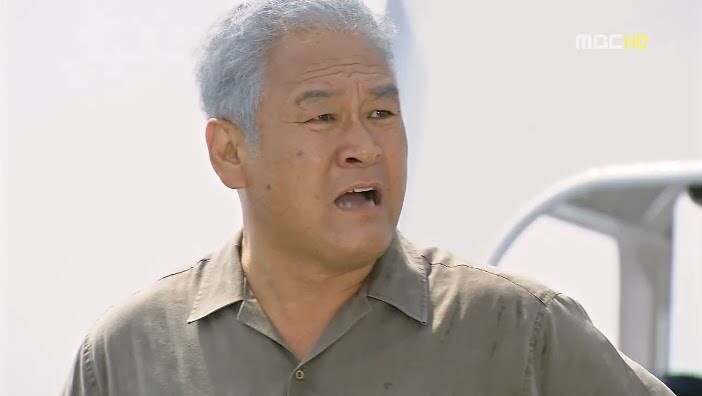 He taught Hae Joo how to drive, surely she didn’t drive the boat out. The search and rescue operations commence and Hae Joo hears the yells and the kids spot the boats. They start shouting, but remain undiscovered. This part seriously confused me. Why didn’t the boats keep going forward more? But they don’t and the kids get upset that help was so close, and yet so far away [meaning there was no way for them to try to swim their rescue cube closer as there was a considerable distance still]. To add insult to injury, it starts raining. So these kids are even more miserable. On the other hand, this would have been a good opportunity for them to try to drink the rain to keep themselves somewhat hydrated, but I guess they didn’t think of that. It’s at this time that Kang San starts passing out due to his leg injury. Chang Hee guesses that San was hurt when he saved him. Hae Joo and Chang Hee both try to keep San awake, but the boy just cannot help falling asleep. Somehow all four of the kids managed to fall asleep. Hae Joo is the first to wake and notice that day has come already. She wakes Chang Hee up first. They both then try to wake San up, but he isn’t moving. In Hwa wakes up and notices something coming at them. She freaks out and thinks it’s a shark. No, she can’t be torn to bits, she needs to die pretty. Even though this is a serious situation, I had to laugh at that comment. It wasn’t a shark, but a whale thankfully. San had managed to wake up and like Chang Hee and Hae Joo, he stares in awe of the animal. One of the small rescue boats returns to the main boat where the parents are anxiously waiting. They have found a piece of the boat. That means the boat has sunk. 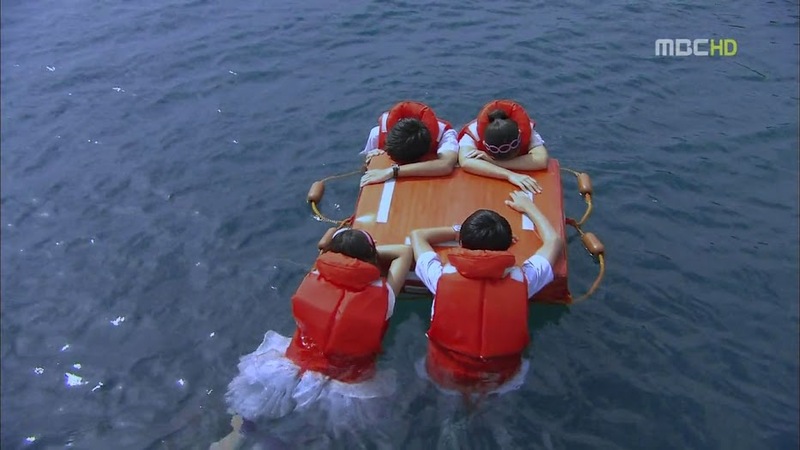 This makes the Jangs, Gi Chul and Hong Chul think that their children are dead since the boat sank. Kang gets angry. Sure, maybe their kids died, but his grandson wouldn’t go down that easily. They will continue looking and at this time, the choppers are finally deployed. Shouldn’t they have been deployed as soon as it was light out? The stupid In Hwa drinks sea water and starts choking. Hae Joo tells her that she can’t drink ocean water no matter how thirsty she gets. In Hwa then passes out and starts floating away. Hae Joo and Chang Hee go to her rescue and get her on top of the cube. However, Hae Joo finally passes out, too and floats away. Chang Hee rushes to her rescue, but can’t get back to the rescue cube with her. He yells out for help from Kang San. San looks up and sees the two getting farther and farther away, but the boy can’t move and passes out once more. The parents are then told the good news that two of the kids have been spotted. Their boat was the closest, so they go to rescue the kids. It seems that Chang Hee found a piece of flotsam and was clinging to it for dear life with Hae Joo. Hong Chul and Gi Chul are elated that their kids were found, but, of course, Kang and the Jangs are very upset as their kids are still missing. This next scene makes me so made. The kids are brought aboard and are unconscious. 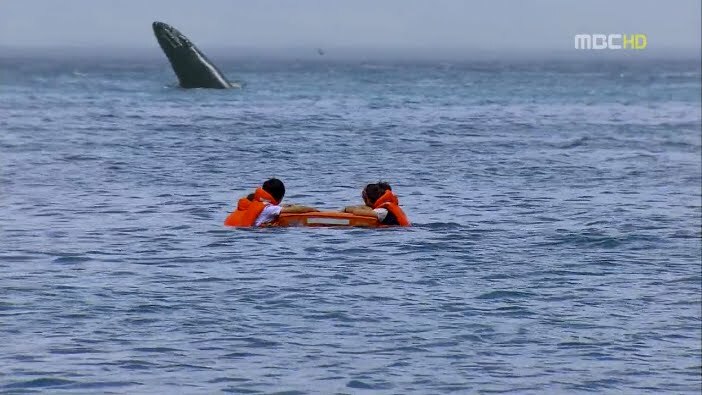 The coast guard says they need immediate medical attention, but the Jangs and Kang keep the boat from turning back since their kids are still missing. This vexes Hong Chul and he rushes to turn the boat around himself, but Jang pulls a gun and swears to kill him if he does so. How can Jang be the boss of everyone? But Kang is no better. Hong Chul goes to reveal his daughter’s true identity, but Park does stop him before he blurts it out. Geum Hee goes to Hae Joo and shakes her. The girl must wake up and tell her where In Hwa is. Hae Joo does come to briefly and tells where the other two are most likely to be found before passing out again. In Hwa and Kang San are then rescued and the four children are rushed to the hospital. San needs to have surgery and a blood transfusion and since In Hwa drank sea water, her stomach had to be pumped and her lungs had water in them, thus those two are in worse shape. Chang Hee and Hae Joo are mostly suffering from dehydration and exhaustion. 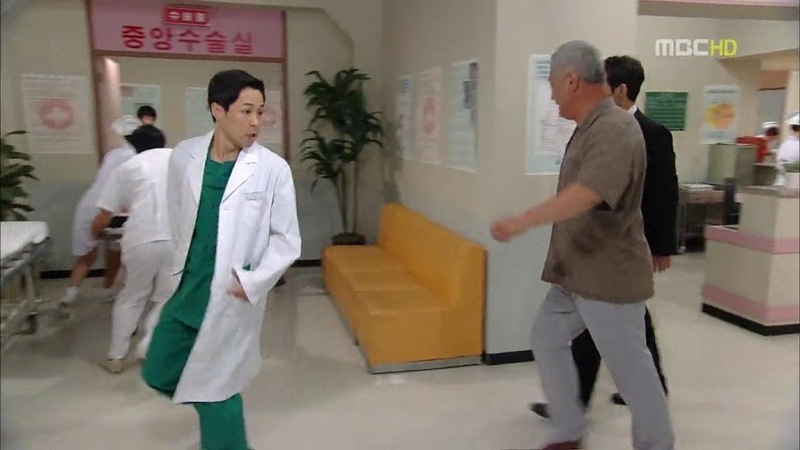 Dal Soon rushes to the hospital and for a moment, I thought that she might actually care a smidgen for Hae Joo. It looked like she was somewhat relieved that the girl didn’t die, but when Kang starts immediately yelling at Hong Chul [he overheard Dal Soon complain about Hong Chul teaching the girl how to drive], Dal Soon quickly rushes home. What a woman. Chang Hee wakes up first and then Hae Joo. The two have their beds side by side. The doctor says that they seem fine, but they will have to go through a series of tests first. You can really see these two kids bonding together here. Well, they did survive an awful ordeal together. Chang Hee is taken out for tests first. Enter Hong Chul. Hae Joo admits she was the one driving and apologizes to her father. He’s upset more at himself for teaching her how to drive. Hae Joo then explains that she really wanted to look at that boat. She wishes to save up money some day and buy her father one just like it. This really cuts Hong Chul to the core. Everything she does his for the family and him. You can see this is probably what leads him to confess her true identity in a different episode—he wants Hae Joo to have a better life. And from this very emotional father-son scene, we move to an airport scene. The transition was so abrupt and such a sudden change that I had no idea what the heck was going on. That was some bad decision-making there I think. Anywho, this woman [Kim Ji Young as Lee Bong Hee] is being felt up by a perv. She hits him and when security comes, he insists he was innocent and she was the one coming on to him. This earns him a kick where it counts. Jung Woo then arrives and is amused to see Bong Hee. It is then revealed that she is a petrochemical scientist and she is quickly let go by security. She then has Jung Woo take her to the petroleum factory where the woman drinks gasoline to figure out what is wrong with the oil. Blech. That shocked everyone—even Jung Woo. She quickly pinpoints the problem and gives instructions on how to take care of it. She then mistakenly grabs the jar of gasoline instead of her coffee and takes a giant sip and spews it back out. LMAO. Random, but it does relieve the building tension from the lost at sea part. Bong Hee and Jung Woo are friends. I’m not exactly certain for how long, but I’m thinking there could possibly be a love line here. She tells Jung Woo that she will be staying with him while in Ulsan to save on hotel expenses. Jung Woo doesn’t like this idea—he lives in a one room house. This doesn’t matter to Bong Hee and she puts him in a chokehold to make him agree. LOL. The two then run into one of the pear orchard owners. He has a dead tree. 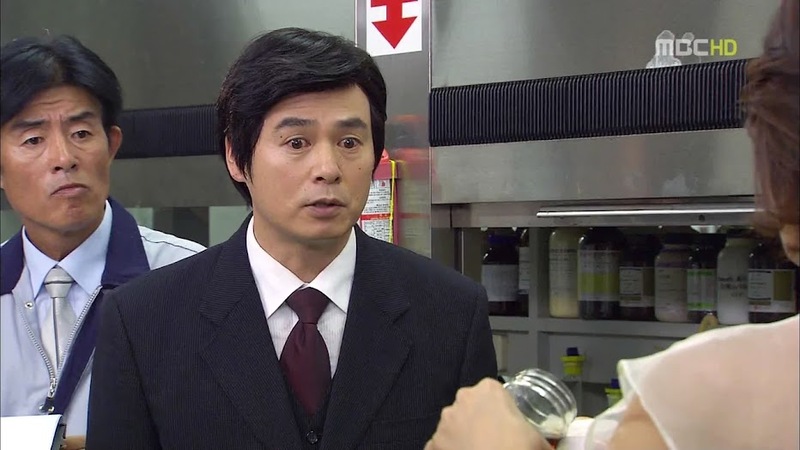 Jung Woo asks if it is from the chemicals, but the man doesn’t know. You’d think that the orchard people would notice the freshly dug spots at the base of trees, but maybe not. Kang San finally wakes up and Kang tells him that he can’t sit up yet thanks to the wound on his leg. San is in quite a bit of pain from it. Kang explains San had to go through surgery and then Kang berates him. Doesn’t San know that he is the only kin left to Kang? Thus, San can’t go dying on him. San gives his customary smile and says that he won’t be dying any time soon. You really do see how closely these children’s lives parallel. Chang Hee had gotten a somewhat similar speech from his own father. 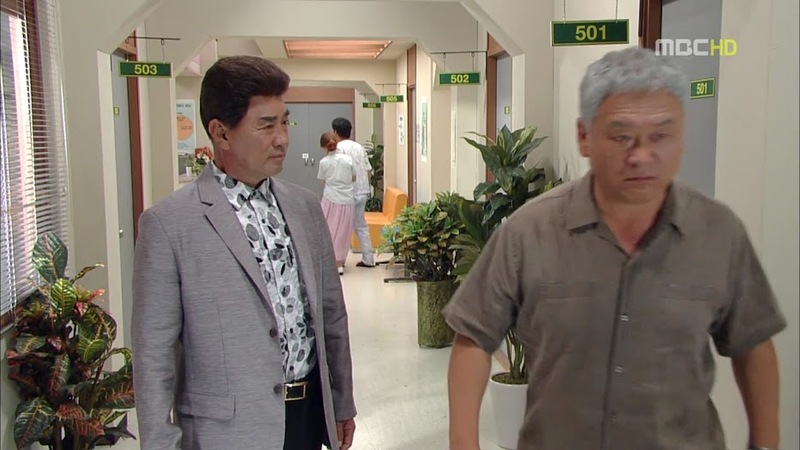 Kang leaves to get a doctor and San complains that he has to lie around and do nothing awhile thanks to his leg. Hae Joo is getting ready to leave, but Hong Chul wishes she stay awhile longer to recover. Hae Joo insists she’s fine and then worries about the hospital bill already. Hong Chul promises to take care of it. Hae Joo then goes in search of In Hwa. The Jangs are still upset that she hasn’t woken up yet. Jang is feeling a bit more at ease since his daughter is alive, but Geum Hee can’t feel at ease. She also still blames Jang for owning a boat. Since losing Yoo Jin to the ocean, Geum Hee didn’t want to lose another daughter and kept In Hwa as far away as she could. Jang leaves to go to work and Hae Joo approaches Geum Hee who slaps her biological daughter for endangering her adopted daughter’s life. Hong Chul witnesses this injustice and can only bawl silently while hiding behind a corner. Chang Hee then goes to see San. Is the boy’s leg all right? San assures him that its fine. Chang Hee thanks him. San says it is nothing. 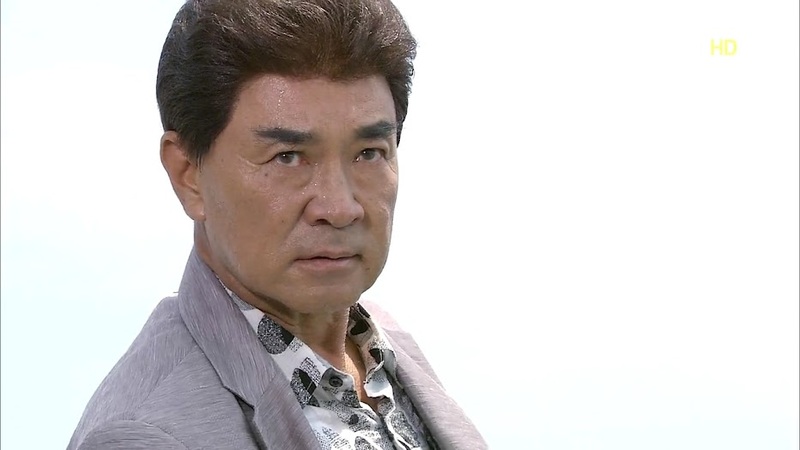 Chang Hee then apologizes for thinking that San was anything like Il Mun. San is happy to hear that his friend has realized that he is not the same time of person as Il Mun. Chang Hee thanks him and apologizes once more. San says only one thank you is needed between friends. This surprises Chang Hee. So they are friends? Of course! It’s so nice that Chang Hee is finally opening himself towards others. On the other hand, I am waiting for love to destroy their friendship. I mean, in Can You Hear My Heart?, the two best friends were pulled apart by birth secrets and falling for the same woman. Love and friendship rarely works out well in dramas. Chang Hee then finds Hae Joo. She is sitting and waiting for her father who had disappeared after going to check her out. The two go out for a drink. Chang Hee notices her red cheek. Hae Joo explained what happened and Chang Hee asks if she isn’t angry over being slapped unjustly. He even offers to tell Mrs. Jang what really happened. Hae Joo tells him not to since In Hwa hasn’t woken up yet. She then also tells him that while the slap may hurt now, the pain will quickly fade for her, but for Geum Hee, the pain of slapping Hae Joo will last a lifetime. That’s pitiful. Hae Joo’s way of thinking really amazes Chang Hee. How can this girl be so against mistreatment of others, but not so much of herself? I don’t get the kids at times. 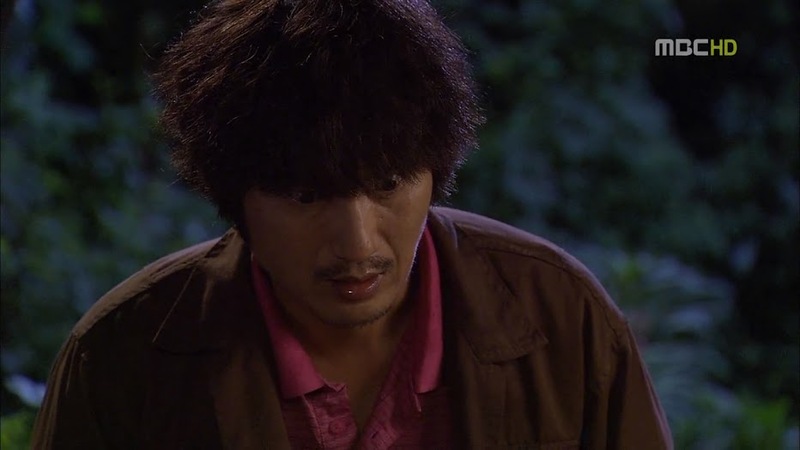 But I really did like this scene as I think it might help Chang Hee lose some of his bottled up rage and resentment. I loved how Chang Hee called her strong and she replied that is something a girl doesn’t like to hear from a boy. Chang Hee then talks about how strong and admirable she is and you can tell this makes her happy. Yep, puppy love is in the air. Hong Chul and Hae Joo head home. Sang Tae immediately rushes out and starts yelling at Hae Joo for all the trouble she caused. This earns him a whack on the head by his father. Hong Chul then tells his son that Hae Joo will be sleeping in Sang Tae’s room since she hasn’t completely recovered. Hae Joo insists she’s fine, but Hong Chul puts his foot down. 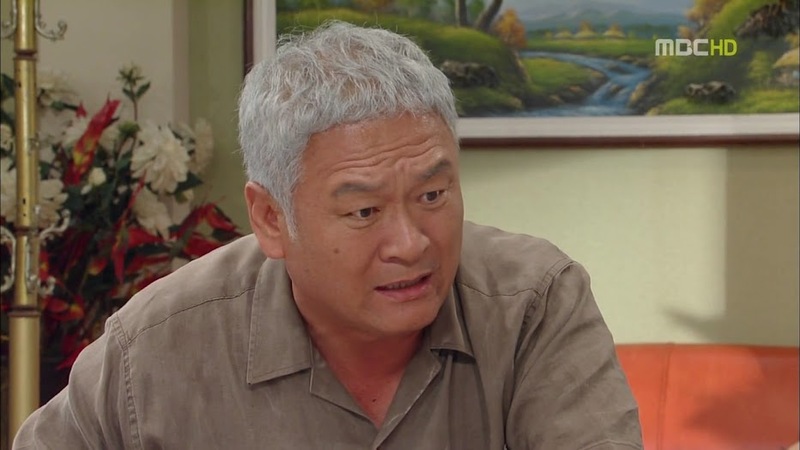 Angry, Dal Soon sends Sang Tae out with money and tells him to take Young Joo for food. Hae Joo is worried that her mother will be angry over this turn of events, but Hong Chul tries to soothe her and says she should rest and he will make her porridge. He gets out of the room and Dal Soon confronts him. They get into the same old argument and this time Hae Joo overhears everything. She rushes off crying, but doesn’t get very far. She then confesses she has known for a while now that she isn’t her mother’s daughter. That’s why she’s been working so hard for the family. She wishes to make mother like her. Heartbreaking. Hae Joo then demands to know her birth mother and that’s where the episode ends. 5 looks crazy. Really crazy. Why does Hong Chul go to Jang instead of directly to Geum Hee? Did he not understand the part where they said that Jang did not lose a daughter, but his 2nd wife did? And of course In Hwa will pin everything on Hae Joo. It’s just not fair. However, if Chang Hee and San get riled enough, they’d vouch for their crush. Thanks! I’m glad you like them 🙂 I am so anxious for next weekend, but it’s only Monday. Quite the wait. Thanks for the recap Neenee! Only 3 episodes running and I could almost predict the angst and emotion that will happen between the 4 children ie our main character. CH will definitely fall for HJ, like KS does, and IH already showed her interest to KS. Its almost like watching Bad Boy with different Backgroud story. It is refreshing to watch a very new site of shipbuilding stuff and all, but the whole plot of the baddies stole the widow and make her his wife; quadruple love (almost all melo and makjang drama has this); or the Jang dad and his two spoiled brat (the three has the same character description in all Kdrama). This show doesn’t give something new to me but the shipbulding industry and hoHJ character, a very strong cinderela who can wield. Yeah, for the basic plot, it isn’t original as it has all the usual drama tropes which can pretty much make the entire plot fairly predictable, but having the series take place in the Ulsan shipyards is pretty new and its refreshing to see our welder princess. I am actually impressed that this drama actually portrays a poor family as, well, poor. Most of the time our poor, penniless leading ladies and males have the latest cell phones and where designer clothes, but here you have HJ wearing the same clothes over and over again, and her clothes are just plain and beaten. I am loving this series for the acting. The children are doing so well and carry on such complicated characters going through emotional turmoil. I am curious to see how the adult cast picks up the characters and changes them when they take over. Well, I technically have a program that I use to create the screencaps automatically and then I just resize them in the post. The fun thing about that is sometimes the program works really well and manages to get the exact shots that I want, and then it gives me these random shots that just don’t work at all or are just too out of focus. Darn action scenes. For whatever reason, that was the case with this episode and thus I was doing them manually which takes a little bit longer. You’re welcome! I am glad your enjoying them. As of now, we don’t know how Kang San’s parents died. I think it might have had something to do with fire as Kang San doesn’t like that one welding type as it uses flames and he was burnt before.